Been a while since there was a Europa League update and as Atletico Madrid have remained strong in the tournament its controlled all the odds. Unfortunately they triumphed over Sporting 2-1 on aggregate and although Griezmann missed a couple of good chances Sporting had more possession and shots and could have easily taken the game to extra time. The one bet still going is Marseille and they are a best priced 4/1 now against Salzburg. The outlay so far has been 3.5pts and if Marseille make it through then the place part of the each way bet will come in. If Marseille win the tournament the bet would make 24.75pts profit and if they make the final and lose then its 7.75pts profit. It therefore makes sense to offset some of this as they are the favourite to qualify. 2pts on Salzburg means if Marseille go out then overall we lose 0.75pts on the tournament. The Champions League kicks in this week with some amazing matches but also the Europa League will sneak back into play as well on Thursday. 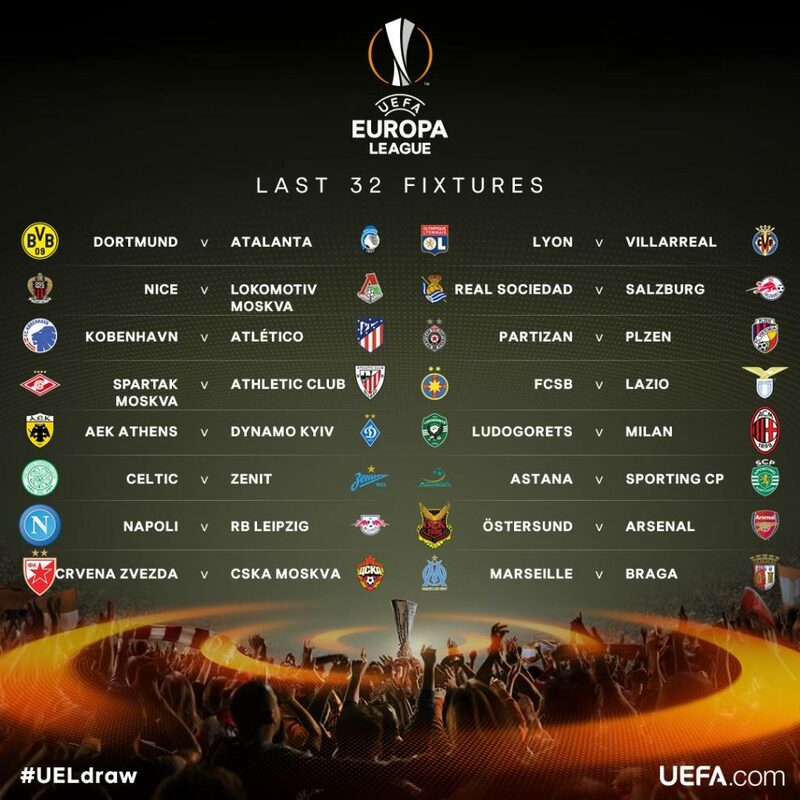 The Europa League fits in one more round than the Champions League. The Europa League was rebranded in 2009-10 and that is a good starting point for analysis as we have 8 tournaments. Since that time it has been won by Spanish teams 5 teams, English teams twice and 1 win for Porto (Portugal). Of the 32 semi-finalists 11 have gone from Spain, 6 from Portugal (none since 2013-14), 5 from England and 3 from Italy and just 1 from Germany with the rest shared out elsewhere. In that time Spain has also dominated the Champions League so their record is especially impressive as it has been the second tier teams winning this tournament. The current odds are Atletico Madrid (4.5), Arsenal (7), Napoli (12), Dortmund (12), Lazio (17) and AC Milan (19). No idea how they calculate these odds but AC are currently 7th in Serie A and not having a good season so it looks like reputation which is putting them so high in the odds. Napoli would be much shorter but they have a tough draw. Neither Italy or Germany have had a finalist in this tournament in the last 8 years and we’re happy to avoid them. Atletico Madrid are short in the market but they are not big scorers and could easily have a couple of 0-0 draws and end up having a penalty shootout during the tournament. In the Spanish League they have managed just 34 goals in 23 games and their price is plenty short enough in such a long knockout tournament and this is not a vintage Atletico team. As you look down the list there are some bigger prices for the Spanish teams such as Villarreal (26), Sociedad (34) and Bilbao (34). There is just one Portuguese team in this which is Sporting Lisbon and they are 34 and have a decent draw. Could it be that the standard of the French League has improved as Lyon were unlucky to not make it to the final last season and with PSG in the league everyone gets the chance to test themselves against the best. Marseille are priced 34 and Lyon are priced 26 and Marseille are above them in the French league and have a much easier draw. Arsenal are the lone English representative but the feel of the club is not good and even with the new signings the anti-Wenger feeling creates too much of a toxic atmosphere. We’re taking a few teams teams in this and first is Villarreal. They have a tough draw but they are having a much better season that either Bilbao or Sociedad. Marseille are a big enough price to be the pick of the French teams and hopefully have enough to beat Braga. There are some easy ties in this round and so the draw to the next round will present some teams with easy matches. The Europa League has been very kind to us and we have had the winner in the last 2 seasons. You can see all the Europa League posts here. The Europa League has run in it’s current format for 7 seasons and the winners have been Atletico Madrid twice, Porto, Chelsea and Sevilla 3 times. Those teams come from Portugal, Spain and England and those countries have provided 20 of the 28 semi-finalists in those 7 tournaments. There are no Portuguese teams in it this year so can be ignored. Spain are the European powerhouse at the moment and they have proven that in the Europa League and previously in the UEFA cup. Of the last 13 finals spanning those 2 competitions a Spanish team has taken the trophy in 8 of them and they have also provided a losing finalist in a couple. This year they probably don’t have as strong a hand as they have in the past with Bilbao, Celta and Villarreal but still should be respected. Villarreal have been drawn with Roma and Celta with Shakhtar and in both those ties the non-Spanish team is favourite. The English clubs, Man United and Spurs, are favourites and Man United are a ridiculously short price at 5.5 when they need to get through 4 rounds before the final. Dortmund were similarly short last year and got beaten in the last 8. This tournament is not an easy one to win especially as later on in the season other priorities come into place. Spurs gave up in this last season and concentrated on the league. 8 of the last 12 winners were Spanish and those 3 times have to bet in our opinion so that is where we will start. Better odds are available on all those prices and use this promo code for bet 365.